The festival this year is between 21st June to 30th June. The Newlyn fish festival is held every year on the late august bank holiday, and celebrates Newlyn's, and indeed Cornwall's, long fishing culture and heritage. Held in the port area of Newlyn's sea front, the celebrations include stalls, fishy demonstrations, open vessels, demonstrations by the RNLI and entertainment from singers and musicians alike. 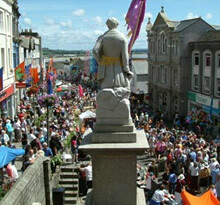 The festival was started in 1991 by Len Scott who wanted to promote and protect the area local areas fishing industry. The proceeds from the festival are given to the Fisherman's mission, who help the family's of fishermen who were injured or lost at sea. So far the festival has been blessed with nothing by fine weather over the years, a tradition which all hopes will continue long into the future. The winter solstice (Cornish: montol) is celebrated by Penzance and the surrounding towns and villages yearly in December. The towns people are encouraged to wear masks and fancy dress. Much like the Golowan festival, the celebrations last 10 days, culminating at the weekend with montol eve, lantern parades through the streets and a beacon at the leskudjack castle. Many believe Montol is the legendary King Arthur's birthday.